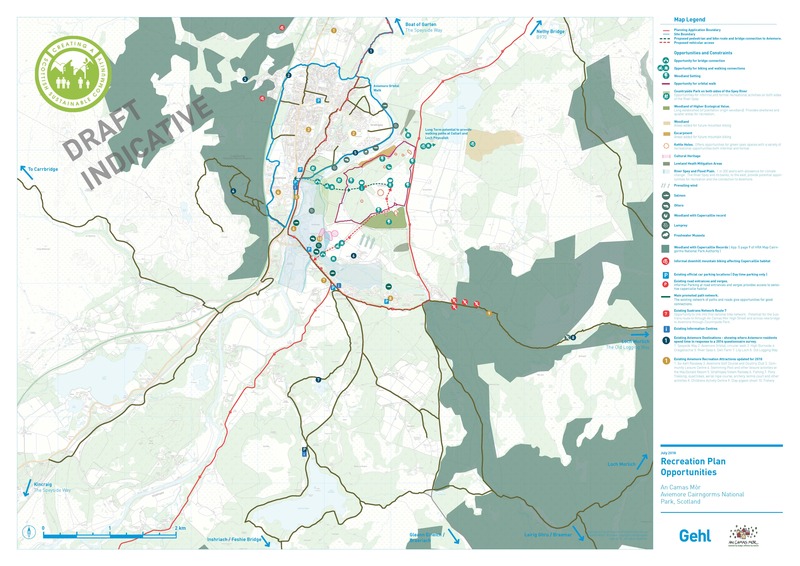 Safe routes for travel by foot and bicycle within easy distance of Aviemore (1km or a 10 min walk), school, work and the shops are carefully designed to make using a car optional, but unnecessary. A new path, adjacent to a new road to Aviemore (1.6 miles to Aviemore Train Station). A new path to Coylumbridge through the woods adjacent to the Nethy Bridge road. A foot and cycle bridge connecting An Camas Mòr with Aviemore that will reduce the off-road distance to Aviemore Station from about 1.6 miles to 1 mile; for comparison, the Dalfaber Co-op is also 1 mile from the station. The foot and cycle bridge will be built before the 200th home is completed, by a condition of planning. The footbridge and Countryside Park is planned to be a community project with An Camas Mòr funding, the Bridge is not yet designed. An Camas Mòr will be accessed by a road which turns off from the ‘Ski Road’ with a bridge over the River Druie; the public sector requires that this is built in advance of any development. Emergency service vehicles and perhaps the public bus will only need to use the B970 Nethy Road to access An Camas Mòr under these circumstances. 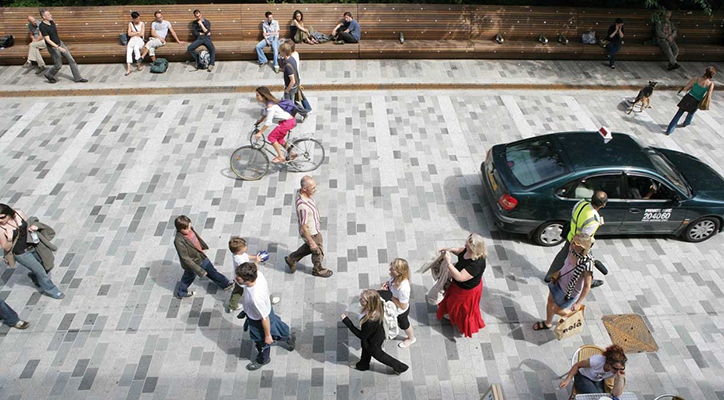 Pedestrian shortcuts are planned throughout the village to make walking an easy and enjoyable experience. Pedestrians will have priority over cars. Almost every home in An Camas Mòr will be 5 minutes walk (400m) from The Primary School, The Shops, Workspaces and other services along the High-street. It is envisaged that, eventually, most people will live and work within the village, with an equal level of commuting to and from An Camas Mòr. The Draft Recreation Plan includes safe and pleasant spaces to walk, exercise the dog close to home and off-road routes to walk straight from the village out into the hills. Draft Local Connections. Jan Gehl, founder of Gehl architects who designed An Camas Mòr, is famous for making Copenhagen a city for cycling. Gehl have applied the same principles that make cycling a safe and enjoyable way to get around in Copenhagen to An Camas Mòr. Green routes and shortcuts are planned for cyclists throughout the village, not fast but not as slow as the shared streets so that it should be quicker to bike than taking the car. There will be a 20mph speed-limit throughout An Camas Mòr, with shared surfaces that give priority to pedestrians except on the bus route. All homes, including flats, at An Camas Mòr are planned with off-street parking. Additional and visitor parking will be provided on side streets and within public squares. Parking on the High-Street is planned for loading and disabled access. There will be a regular bus service from An Camas Mòr, Aviemore and local villages. 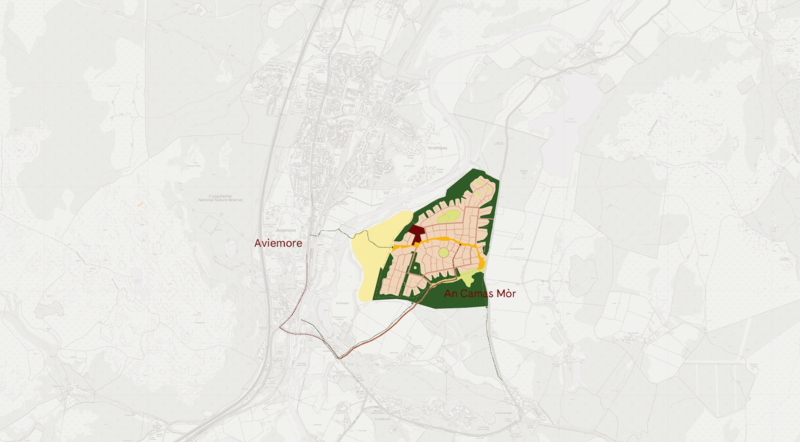 The Aviemore Train Station will be within walking and cycling distance of An Camas Mòr. There is a direct train service from Aviemore to Inverness (40 minutes), Edinburgh (2 hours 50 minutes) and London (daily 7 hours 30 minutes). Inverness Airport is only 45 minutes from An Camas Mòr by car. Direct flights from London take just over an hour.